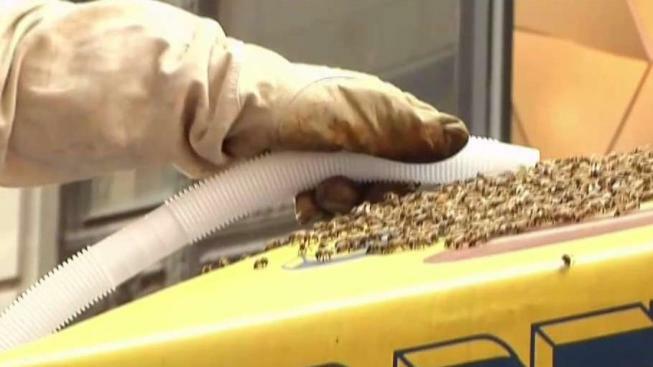 An umbrella on top of a nearby hot dog cart was almost entirely covered with bees Tuesday. Ray Villeda reports. 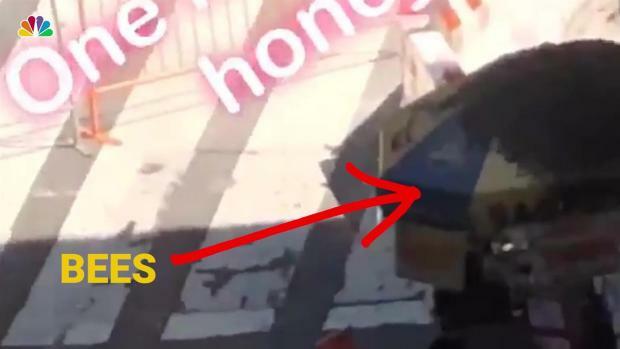 A Times Square intersection was cordoned off after a swarm of bees engulfed a food cart, videos shared by social media users showed. A video taken around 1:30 p.m. on Tuesday showed bees swarming above an intersection near the Hard Rock Cafe, at Broadway and West 43rd Street. An umbrella on top of a nearby hot dog cart was almost entirely covered with the insects, another video showed. A beekeeper from the city carefully removed the bees from the umbrella with a vacuum, while some stray bees made their way to the façade of a nearby café, video showed. A Times Square intersection was cordoned off after a swarm of bees engulfed a food cart Tuesday.